Essential plot rundown: An opera enthusiast goes through great lengths to accomplish his dream of bringing an opera house to a small town. I just watched the documentary about this, so I had to watch this too. This movie is just shy over 2 and 1/2 hours. And considering its topic and production date, I was expecting it to be really boring. But to my surprise, it wasn't that boring. Yes, it is really slow paced; an hour passes before the boat even sets sail. It does feel its 2 1/2 hours, but it was interesting enough; it walked a fine line. But, I really liked the message the most. Fitzcarraldo is a dreamer. And will stop at nothing to accomplish his dream, even carrying a steamboat over a mountain, if he has to. At one point, he says (or was it his wife? I can't remember): "It's only the dreamers who ever move mountains." After watching Burden of Dreams, I could see a lot of Herzog in Fitzcarraldo; he is 110% dedicated to his idea, even nigh unto lunacy. 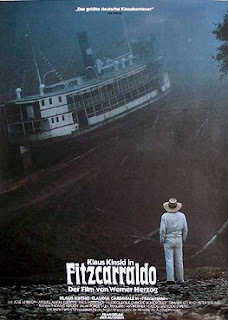 Fitzcarraldo is to the title character as Burden of Dreams is to Herzog. 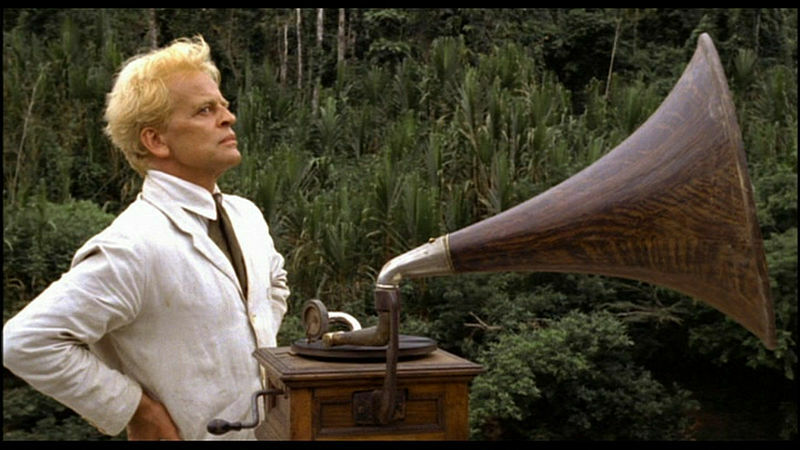 Even with huge complications, Fitzcarraldo always plays a record of his favorite opera singer to keep him motivated. The visuals were good. It was filmed on location in South America; so, there was a lot of pretty scenery. And also seeing them move the ship uphill was impressive, knowing that they actually did it. Now a days, it would have been completely CG and wouldn't have been as dramatic. One thing that bothered me was that the actors' lips never seemed to be synchronized with the audio. It always seemed off. But, then I just found out that the whole film was done in English (for the benefit of the cast and crew) and then later dubbed into German. So, that makes sense. But, overall, it is worth watching. It is long and slow paced, so I wouldn't recommend it if you have a short attention span. I would probably not watch it again, myself; once was enough. Great site you you've got here. Thanks to this review I decided to finally watch Fitzcarraldo. Thanks. Glad I could be of some help.